"…So too, the most familiar books reveal more about themselves when we attend to them anew. And our growing experience allows us to approach our favorites from different angles. In a sense, rereading the same book produces new insights because the reader is a different person. Indeed, a good book is very much like a mirror: The glass is the same year after year, but the reflection in it changes over time. Don’t pay any attention if your conscience tries to make you feel guilty for taking the time to reread a favorite book this winter. It is more fruitful and satisfying to read one good book well than a thousand poorly. And the best books cannot be read well without rereading." What a relief to know my indulgent habit is shared by other, and better yet, it is actually good for me. Kind of like red wine and dark chocolate. I no longer had to carry around the guilt that I should be plowing through new books, and not waste my time reading stuff I’ve already read. I no longer had to bleat a feeble excuse when friends lambasted me about reading anew an old favorite. And new is always better than old. Right? Amirite? Other art forms are enjoyed multiple times—paintings and music and dance. 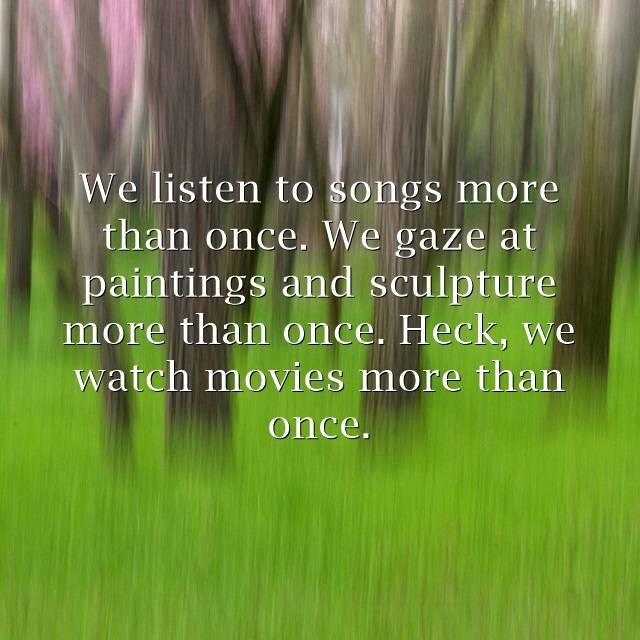 We listen to songs more than once. We gaze at paintings and sculpture more than once. Heck, we watch movies more than once. So, why not books? Why can’t they get do-overs? One: It is an author who inspires my own writing. And when I’m stuck on my own writing, I re-read how they solved the problem. I call this Karchut University. It’s how I learned to write. It’s how I’m still learning how to write. The Lord of the Rings (once a year since I was eleven.) They are why I write mostly fantasy. The Prydain Chronicles by Lloyd Alexander. These books are why I write mostly middle grade. The Mitford series by Jan Karon. The Longmire Mysteries by Craig Johnson. The Harry Potter series by What’s-Her-Name. (Just kidding). Okay, time for confession: I’m curious to hear what books you re-read, and how many times. Don’t be shy. ‘Fess up. An empty comment box is a sad and pitiful thing. Darby, I thought it was weird to tell people I reread books. As though I was unfaithful to the new books on the market. I love this, and now can admit, I often reread my favorite books. Don't feel pitiful if people blog by without comments. Your blog has been up since 8 a.m. and there's already been 111 page views.Great post. I like so many of these authors, Starr! Good choice all the way around! Oh, I have several favorites that I re-read. Sometimes you just want to curl up with an old friend! Like you, I put The Lord of the Rings and The Mitford series on my list as well as these: Plainsong by Kent Haruf, Lake News by Barbara Delinsky, Pride and Prejudice by Jane Austen, The Poisonwood Bible by Barbara Kingsolver, Montana Sky by Nora Roberts, and The Divine Secrets of the YaYa Sisterhood by Rebecca Wells. Yes, they are all over the place in terms of genre! Great choices! I have to pick up the latest Mitford book. Can't wait! Ok, I admit to re-reading several of Molly Harper's books. How To Seduce A Naked Werewolf, How To Flirt With a Nake Werewolf, etc. Love her sass and humor. Oooh, I may have to try that series! And congrats on all your successes! So glad to hear you're "one of us", Donnell. I will now admit I re-read a few of my books just for fun, too. For the exact reason: missing the characters. I'm a re-reader, too. Classics I read in school now say so much more to me. I guess because I've lived long enough to recognize the layers to the characters and the depth of the situations. Enjoyed your article. Thanks, Ann. I know what you mean about classics taking on new meaning when we re-read them later in life.